Kisan Mela & Agril. Exhibition under New India Manthan: Sankalp Se Siddhi programme. Objective: To motivate the farmers for doubling their income with various technologies. KVK, Solapur has planned to conduct New India Manthan: Sankalp Se Siddhi programme at KVK, Solapur on 23.08.2017 as per the directives received from ATARI, Pune. Kisan Mela & Agril. An exhibition is planned under the programme. The inauguration of this programme will be made by the auspicious hands of Honourable Mr. Sharadji Bansode, MP, Solapur & Honourable Mr. Vijaykumar Deshmukh, Minister for State, Public health, Transport, Labour, State Excise & Guardian Minister, District Solapur. The programme will be chaired by Hon. Mr. Pradeep J. Gaikwad, Chairman, SKP, Solapur. The other dignitaries will be present on the occasion are Hon. Mallikarjun M. Patil, Speaker, Committee Agriculture & Livestock, Z.P. Solapur. Sau. Sandhyarani I. Pawar, Speaker, Panchayat Samiti, North Solapur, Mr. Vijaykumar Ingale, JDA, Pune and other heads of line departments. The interactive lectures on various topics will be organized to pass on the messages about how to increase the income. Chief Guest's Name: Hon'ble Member of Parliament, Solapur Advocate Sharad Bansodeji. Chief Guest's Remarks:Member of Parliament, Solapur Advocate Sharadji Bansode desired that there is need of use of improved technologies for sustainable income in agriculture, he also highlighted the concept of New India Manthan: Sankalp Se Siddhi programme. Further he added the importance of 7 point for doubling the farmers income & became the India as super power by 2022. Post Event Details:KVK, Solapur has conducted New India Manthan: Sankalp Se Siddhi programme at KVK, Solapur campus on 23.08.2017. Under this programme Kisan Mela & Agril. The exhibition was organized. The programme was inaugurated by Member of Parliament, Solapur (M.S.) Advocate Sharad Bansodeji. This function was presided over by Honorable Mr. Pradipji Gaikwad, Chairman, Shabari Krishi Pratishthan, Solapur. Other dignitaries present on this occasion were Honorable Mr. M.M. Patil, Speaker, Committee on Agriculture & Animal Husbandry, Z.P. Solapur, Dr. R. K. Pal, Director, NRCP, Solapur, Dr. V. M. Amrutsagar, ADR, NARP, Solapur, Mr. B. G. Birajdar, DSAO, Solapur, Mr. P. M. Zile, DDM, NABARD, Solapur, Dr. L. R. Tambade, Senior Scientist & Head, KVK, Solapur, Mr. Harshwerdhan Dhawan, Trustee, SKP, Solapur, Mr. Rajendra Deshmukh, Progressive farmer & Mr. N. M. Kaspate, Innovative Custard Apple Grower, Barshi. 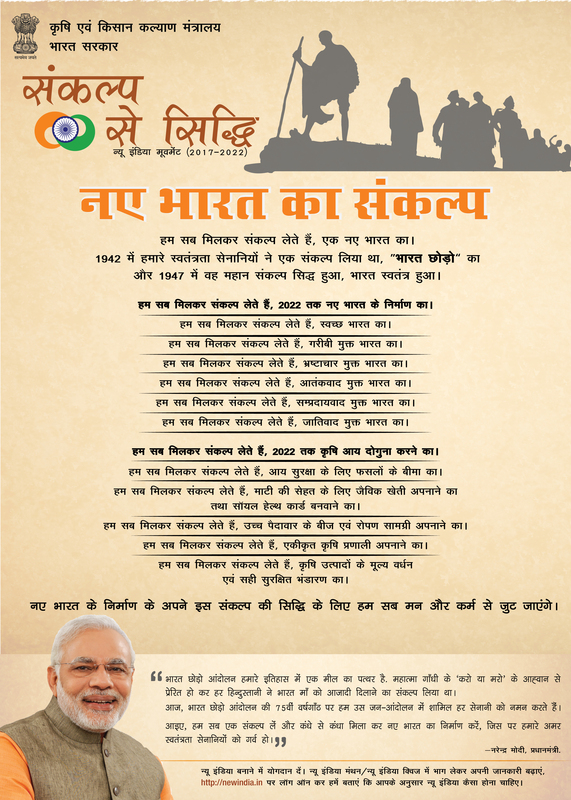 After the inaugural session message of Hon’ble Prime Minister (Video) was shown. Dr. V. M. Amrutsagar, ADR, NARP, Solapur stressed on adoption of the integrated farming system. Dr. R. K. Pal, Director, NRCP, Solapur briefed about entrepreneurship development through pomegranate processing. Mr. R. P. Deshmukh Shared his success story of Dragon fruit farming. Mr. P. J. Gaikwad, Chairman, Shabari Krishi Pratishthan, Solapur emphasized that farmers should use Hi-tech horticultural technologies for improving the profitability. 550 farmers, farm women & extension officials attended. Image: KVK, Solapur conducted New Indian Manthan: Sankalp Se Siddhi programme on 23.08.2017, Glimpses of the programme. Video :New India Manthan: Sankalp Se Siddhi programme conducted on 23.08.2017, A short video about the programme.